Hopefully you’ll never have to use the Find My iPad mini feature — even though it’s pretty darn cool. If you inadvertently leave your iPad in a taxi or restaurant, Find My iPad may just help you retrieve it. All it takes is a free iCloud account. Well, that’s almost all it takes. You’ll have to turn it on, though, so tap Settings➪Mail, Contacts, Calendars, and then tap your iCloud account. Or tap Settings➪iCloud. Either way, make sure Find My iPad is switched to On. Log on to your iCloud account at iCloud from any browser on your computer. Click the Find My iPhone icon. If you don’t see it, click the icon with a cloud in it that appears in the upper-left corner of the iCloud site. You see a panel with icons that are tied to various iCloud services, including Find My iPhone. 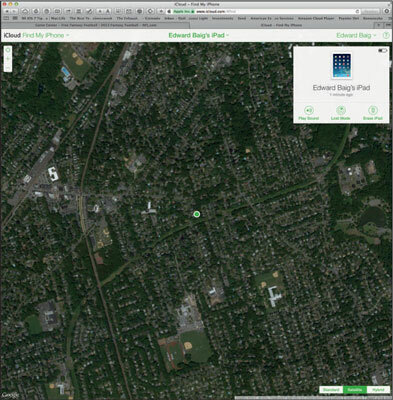 Yes, even though the feature is Find My iPad on the iPad mini, it shows up as Find My iPhone on the iCloud site. Don’t worry; it’ll still locate your iPad — and, for that matter, a lost iPhone or iPod touch, and even a Mac computer too. Assuming that your tablet is turned on and in the coverage area, its general whereabouts turn up on a map, in standard or satellite views, or a hybrid of the two. The truth is that even seeing your iPad on a map may not help you much, especially if the device is lost somewhere in midtown Manhattan. Take heart. At the iCloud site, click the Lost Mode button. Type a phone number at which you can be reached, as well as a plea to the Good Samaritan who (you hope) picked up your iPad. 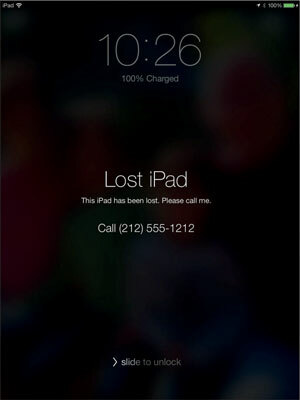 Apple has already prepared a simple message indicating that the iPad is lost, but you can change or remove the message and substitute your own plea for the return of your tablet. The message appears on the lost iPad’s screen. To get someone’s attention, you can also sound an alarm that plays for two minutes, even if the volume is off. Tap Play Sound to make it happen. Hey, that alarm may come in handy if the iPad turns up under a couch in your house. Stranger things have happened. Find My iPhone (which finds any iOS device) is now available as a free app in the App Store. Another free app called Find My Friends, as the name suggests, will locate your friends on a map. Just hope that when you find a particular pal, he’s not the one who snatched your missing iPad. Meanwhile, the person who found (or possibly stole) your iPad cannot reactivate the device to use as his or her own, or to peddle, unless he or she successfully types in your Apple ID. Another new addition: Even if you choose to erase the device remotely, it can still display a custom message with the information needed for someone to return it to you. If, indeed, you ever get your iPad mini back, you can always restore the information from an iTunes backup on your Mac or PC or iCloud.